Risk expresses the likelihood that the harm from a particular hazard will be realised (for example the risk of slipping on a patch of water). A hazard is something with a potential to cause harm (the patch of water). Hazards only present a risk when there is human interaction (someone treading in the patch of water). A risk assessment involves identifying the hazards present then evaluating the extent of the risks involved, taking into account any precautions already in place (identifying the patch of water as a potential problem; noting that it will be walked past; a sign saying 'slippery floor' is in place). What hazards are the visitors likely to face? What kinds of behavior will increase the risk? How can these risks be controlled? 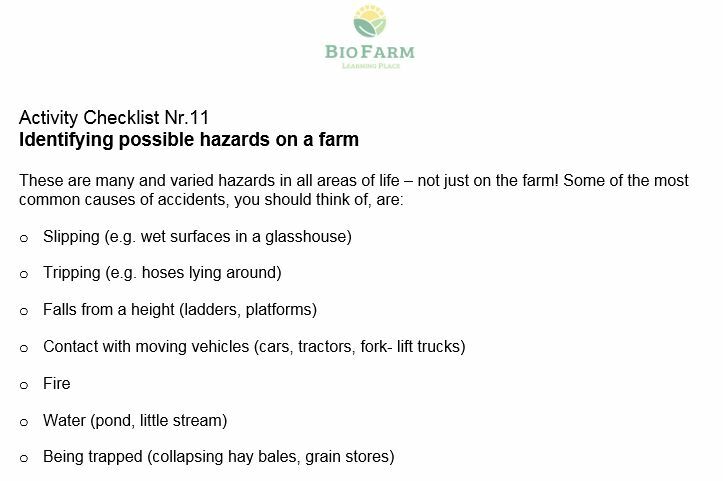 The farmer should be reviewing hazards on an on-going basis and employing risk-assessment techniques. The teacher should, if possible, make a pre-visit check on the location's risks and point out any hazards that she/he feels need management.